Portland Oregon had its collective mind blown in recent weeks. 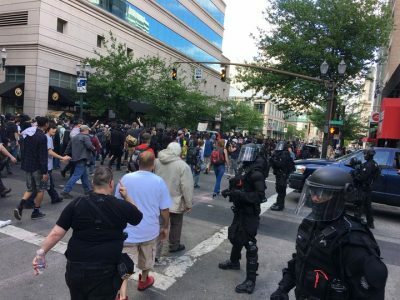 A Nazi murdered two people on public transit and a week later, on June 4th, Portland police were ‘protecting and serving’ a rally of 300+ ‘Alt-Right’ white supremacists from a counter-protest of over 3,000. “I declare open season on Antifa [anti-fascists], squash on sight”. Other far-right groups at the rally were the Oath keepers, Three Percenters , Proud Boys, and the Warriors for Freedom. This loose coalition of fascist-minded groups are being led by genuine fascists: the person who coined the term Alt-Right, Richard Spencer, has been quite open about his White Supremacy, which is the dominate ideology among alt-right groups. The alt-right’s strategy has been mobilizing in key ‘progressive’ cities and provoking anti-fascists into a fight, while using ‘freedom of speech’ as a populist tool to demonize those who ‘oppose the first amendment’. This strategy has proven effective as a way to push public sentiment against ‘black bloc’ anarchists, making the fascists appear to be ‘the good guys’ that are being attacked by authoritarian anarchists that seek to squash unpopular ideas. Ultimately the fascists do well when they fight with anarchists in the streets; the fascists stand a fighting chance so long as the size of both groups are small. Even a ‘draw’ is a victory for the fascists, who for years have stayed underground due to their small numbers. Across the street (to the south) at city hall a coalition of 70+ labor and community groups rallied, lead by the International Socialist Organization, whose aim was a united front to rally the biggest number of people against the fascists. This group organized, in part, because they believed, correctly (in this writer’s opinion), that a smaller group of ‘militant’ counter-protesters clashing with the far-right would amount to folly, and play directly into the hands of the fascists that came to fight. Across the street (to the east) of the fascist rally was a counter-protest organized by Rose City Antifa and the Anti-Fascist Workers Collective. This protest attracted nearly a thousand people (many who who dressed in ‘black bloc’ clothing), and was billed as the more aggressive of the protests. Many in this group sought to give ‘no platform’ to the fascists and were expected to take a more physically confrontational approach. Across the street (to the south) was another counter-protest, organized by another socialist group, Class Struggle Workers, which was endorsed by several labor unions and attracted hundreds of people. In reality many counter-protesters walked seamlessly between the rallies, not realizing (or caring) about the political-tactical differences. There was a lot of talk about occupying the park before the fascists showed up in order to prevent them from having their rally. This tactic was likely impossible before the Nazi killings, simply because there wouldn’t be enough people to make it a reality. After the Nazi murders the balance of forces shifted sharply in favor of the counter-protesters: people were disgusted that the alt-right would act so provocatively after such a tragedy; and the broader community felt a need to take a stand. Thus, the conditions for mobilizing to stop the rally–and defeat the alt-right fascists outright– became more possible, though unrealizable due to lack of organization: the competing rallies had already divided the forces, and it remains questionable how many attendees would have been ready to risk that level of confrontation. If thousands had occupied the square the fascists may have faced total defeat; but if only hundreds occupied the square the fascists may have had the brawl they wanted and could have declared victory, rally or no rally. The organizational wheels of the counter-protesters were already set in motion, and were not flexible enough to adjust to the new circumstances. This gets to the heart of the matter: tactics cannot be separated from power. More power equals more options for tactics. The Left, however, cannot exercise maximum power without mobilizing the broader community, and this requires the United Front strategy, where a broad coalition of groups agree to come together around a single issue that they agree on. More people = more power; this truism is the foundation for successful anti-fascist organizing. In Portland there was exhaustive debate leading up to the rallies about preventing the fascist rally from proceeding. Mayor Ted Wheeler asked the Trump Administration to pull the rally permit (which was on Federal property; of course Trump did not oblige). Leftist Portland City Commissioner Chloe Eudaly took a more militant stance against the alt-right rally, and the Left were divided against themselves on whether or not it was ok to try to prevent the rally. The conversation had an educational effect on Portland’s Left while also, unintentionally, galvanizing the fascists, who were successfully able to paint themselves as ‘victims of government repression’. 1) why did police allow a far-right militia man to co-arrest a counter-protester? 2) why did the police use rubber bullets and tear gas against hundreds of counter-protesters? 3) why were the police so obviously chummy with the far-right protesters? The answer is that the majority of police share a far-right political outlook, and are very sympathetic to these movements if not actual members of alt-right groups themselves. A further reason to distrust government action against fascist movements is that, historically, the ruling class has directly supported fascist movements as a hammer against the Left in times of social-economic crisis. The police’s actions in Portland are a microcosm of what to expect from the national establishment in relation to fascism. There is a big difference between asking the government to stop a fascist rally versus mobilizing independently to stop it. But even with this distinction many Portland liberals –and the Oregon ACLU — loudly protested that the fascists have a right to ‘freedom of speech’. A very similar debate occurred the last time a real fascist movement existed in the United States, which grew alongside Hitler’s rise to power. In 1939 a mass Nazi rally was organized at New York’s Madison Square Garden. Liberals loudly defended the Nazis’ right to organize, since it was ‘freedom of speech’. Meanwhile in Germany Hitler had already consolidated dictatorial powers and annexed Austria, already having decapitated the Left with concentration camps filled with leaders of the labor union, socialist and communist movements. The Jewish holocaust was just gaining its legs while U.S. liberals demanded that U.S. Nazis be give space to organize. Ultimately the liberals of today decrying ‘freedom of speech’ for fascists don’t understand what fascism is and the very real threat it represents. The hate crimes exploding across the country–including Portland’s Nazi double murder– are being perpetrated by the vanguard of this fascist movement. They are not ‘crazy’ or ‘deranged’ individuals, but true believers in white supremacy who are emboldened by a movement that is fighting a race war. They are the shock troops. Liberals also don’t realize that an actual fascist movement was birthed alongside Trump’s election; the cockroaches have boldly crawled up through the floorboards, and they are organizing for power in a strategic way. Who are their enemies? They say it loudly: “the liberals, socialists, Communists, anarchists”. They are a politically conscious movement that is following the footsteps of successful fascists before them. But this ignorance of liberals is, in part, why the debate about ‘freedom of speech’ must be secondary to organizing a united front against fascism. An abstract debate around democratic rights will not win the broader community to act against fascism. Ultimately the only way to crush a rising fascist movement is a larger movement of labor and community groups, requiring that a United Front strategy. A variety of tactics can be implemented under the umbrella strategy of a united front, but without mobilizing the broader community winning is impossible. Organizing a powerful united front offers the opportunity to educate the broader community about the real threat that fascism represents. Without understanding how fascism crushes working families and ethnic and religious minorities, sections of the broader community will be sympathetic to the alt-right’s ‘freedom of speech’ rhetoric, while others will remain confused or ambivalent about the political issues at stake. Once the broader population is educated about the issues via a united front, the more likely they’ll be willing to engage in more militant mass action; people also feel more confident about engaging in actions when there are thousands of people involved, rather than dozens or hundreds. Ultimately the fight for the hearts and minds of the broader community is critical in this struggle, too often ignored by the Left. The United Front makes the broader community its focus; millions of people are watching these demonstrations on TV, and our signs, banners, and chants need to be directed to the TV cameras, so that those watching at home know what side to choose (and perhaps join in the streets). It’s arguable that the far-right in Portland did a better job promoting its message to the community. The rally’s organizer, Joey Gibson, is a committed activist and excellent public speaker who is serious about growing his movement by any means necessary. His speech was intended to inspire those present while appealing to the broader community. He also appealed to the different factions of the alt-right to come together and stop their petty difference (essentially a ‘united front’ of the far-right). Meanwhile, many of the counter-protesters seemed uninterested in public opinion, conceding the TV cameras to the fascists. An ongoing chant from the more radical anti-fascist protest was “A-C-A-B, All Cops are Bastards”. And although disliking cops is fine, such chants do very little to gain broader support and show a lack of seriousness in organizing and confronting the alt-right. The united front rally at City Hall was more focused on strategic messaging and appealing to the broader community. The counter-protests were ultimately successful in proving that the public was against the far-right, and that was itself a victory. 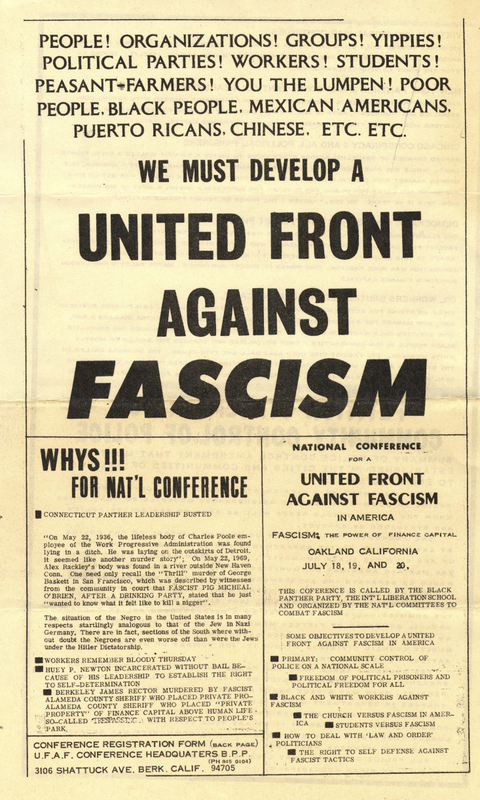 However the fascist rally was allowed to continue, and the far-right was able to declare victory through their inspiring speeches that kept morale high as they continue to organize to win. Actually stopping fascist movements in their track is possible, as opposed to simply protesting them. 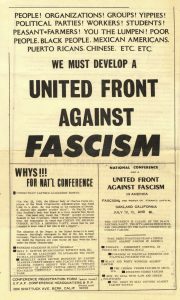 There are many examples in the U.S. and Canada of crushing incipient fascist movements using the united front strategy, though a larger movement has not been present in the U.S. since the 1930’s. The most famous case of mass united front action to shut down a fascist movement happened in 1936 in London, when the English Nazis attempted a march and rally through East London (a working class area with a large Jewish population). The ‘Battle of Cable Street’ showcased 20,000+ anti-fascists mobilized against 2,000 fascists and the thousands of police who attempted to clear a march route for the Nazis. It was a total victory for the anti-fascists: the march was cancelled and the fascist movement lost momentum, since it was exposed as being hated by the vast majority of people who were willing to take bold action against them. The cost to become a fascist was simply too high after the defeat at Cable Street. The battle for Cable Street has a lot to offer for anti-fascist mobilizations. But before mass direct action is possible, we need a united front movement. 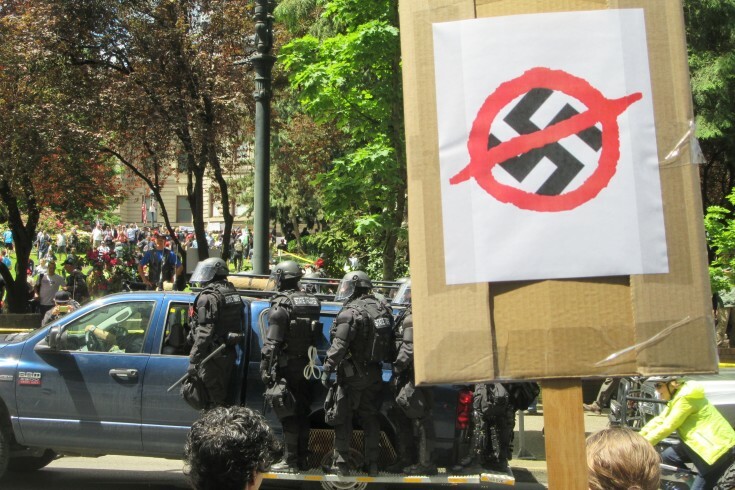 The anti-fascist coalition protest in Portland was an important step forward in this regard. A further step might be what the Black Panthers did in 1969, when they organized a United Front Against Fascism conference in Oakland that attracted thousands of people from across the country, which spawned organizing committees in different cities. In Portland the coalition that organized the counter-protest could organize a citywide or regional conference. To ensure that such a conference is a genuine united front, it should be co-organized by several Left, Labor and community groups, rather than giving the impression that one group is using the conference for notoriety or recruitment, etc. Although the Portland protest showed promise in anti-fascist organizing, it also showed that the fascists are stronger than we expected. The alt-right still has momentum and will strive to bait smaller anarchist contingents into street fights, which ultimately benefit the fascists at this stage. With Trump in office the fascists will have plenty of opportunity to engage with a larger base of Trump supporters, defending “their President” against a “dangerous and unreasonable” grouping of “liberals and Communists”. Such a complicated dynamic requires that the left take the situation seriously and organize for power by mobilizing the broader community, by any means necessary.